In a press conference yesterday, Gen. Metin Gürak accused prosecutors of violating the constitutionally enshrined principle of the presumption of innocence. Gürak's comments are a reflection of heightened criticism of the Ergenekon investigation emanating from the Turkish Armed Forces (TSK) following this latest tenth wave of arrests (see a summary from Bianet, Jan. 12). This most recent criticism comes in response to accusations made by police informer Tuncay Güney on television yesterday against Ret. Gen. İsmail Hakkı Karadayı. President Gül warned that putting pressure on the judiciary while the Ergenekon investigation is underway will undermine the investigation and further polarize Turkish politics. However, it is clear that the judiciary, the military, politicians, and the Turkish press are already very polarized, creating tremendous doubt as to whether objectivity -- by the judiciary, or any other sector of Turkish society -- is in fact possible. 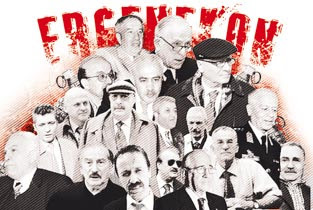 Recent analysis by Lale Sarııbrahımoğlu considers divisions within the TSK as to the proper position the TSK should take in regard to the Ergenekon investigation, cleavages between Asianists and Europhiles, pro and anti-coup forces. Sarııbrahımoğlu assesses the TSK's reluctance to denounce Ergenekon and some recent infighting as a possible function of NATO involvement in TSK affairs. The TSK is far from a monolithic entity, and throughout recent years, chiefs of staff have taken different positions toward international affairs and intervention in domestic politics. See also Emrullah Uslu's analysis of different actors in the Turkish judiciary. The Ankara and Istanbul Bar Associations, as well as the Judges and Prosecutors Union and some sitting judges have expressed criticism of the investigation, while others have refrained from comment. These divisions manifest themselves on the Supreme Court of Appeals. The arrest of the Court's former prosecutor, Sabih Kanadoglu, has increased tensions in the judiciary. Adding to the drama of the last wave of arrests is the apprehension of Ret. Brig. Gen. Levent Ersöz, who just narrowly escaped to Russia last July before police could apprehend him. Ersöz is thought to have worked directly underneath Ret. Maj. Gen. Veli Küçük, and to have been the leader of the clandestine (and illegal) JITEM gendarmerie intelligence unit. Ersöz and JITEM are likely responsible for mass atrocities committed against Kurds, including the forced disappearances of HADEP politicians Ebubekir Deniz and Serdar Danış in 2001, Turkey's failure to open an investigation into which resulted in an ECHR ruling against it and an order that €170,000 be paid in damages. In other news, more weapons caches were also discovered near Ankara and İstanbul.